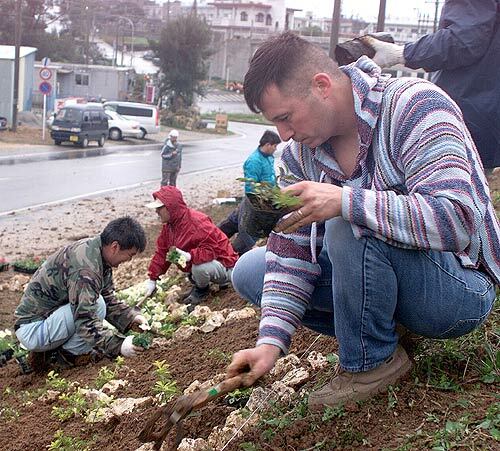 CAMP HANSEN, Okinawa, Japan — Marines are known worldwide for accomplishing great feats under harsh conditions. In any environment, Marines will march for miles, assault any hill and overcome any obstacle. On a cold and rainy Saturday morning, 26 volunteers from Truck Company, Headquarters Battalion, 3rd Marine Division, took time out of their day to assist in an ongoing project between the citizens of Kin Town and the personnel aboard Camp Hansen. Renewing the previous work of the G8 Summit in 2000, the corner of Highways 329 and 104 is the site of a landscaping effort by the two communities. The project started in late November when a group of Marines from III Marine Expeditionary Force Headquarters Group and members of the Kin Town Chamber of Commerce worked together to spell out "Kin Town Chamber of Commerce" in the Kanji alphabet with stone formations. "Our goal here this morning is to complete the work that was started just over a month ago," said Maj. Craig R. Dearth, deputy camp commander, Camp Hansen. "We plan to spell out ‘Camp Hansen’ within the landscape area by placing stones and planting flowers." Ankle-deep in mud, the Marines from Truck Company worked hand-in-hand with the 25 Kin Town volunteers to complete the project. Although the weather was a contender to deal with, it turned out to be another asset in their efforts. "The rain does make it difficult because of the risk of slipping on the muddy ground," Dearth stated. "But it's turned out to be a good thing because the Earth is now very soft and easy to dig into." Completing the job an hour earlier than expected, the Marines were invited to the Chamber of Commerce building in Kin Town for a hot bowl of Soba as a way of saying thank you from the citizens of Kin Town. Admiring their finished work, the Marines took pride in their accomplishments. Not only have they made a portion of the community look better, but did it with the help of their neighbors. "Its nice to get the good feeling of satisfaction whenever you complete a project like this," said Lance Cpl. Kevin J. Beavers, maintenance management specialist. "I think it's important to give back to the community."